HK$20 banknote commemorating the Beijing 2008 Olympic Games was issued by Bank of China (Hong Kong) Limited. Officially released in Hong Kong July 15, 2008. Total 4 prefixes released: AA, HK, BJ and "772070". The Olympic Banknote, bringing together the Olympic Games and philanthropy, was the first commemorative banknote ever issued in the history of the modern Olympic Games. 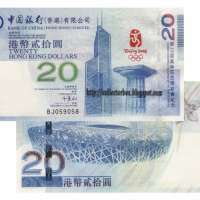 Four million of the HK$20 ($2.56) Olympic banknotes were issued, depicting a Greek pillar on the front and Beijing's Olympic "Bird's Nest" stadium on the back side. A total of 3.76 million were sold in Hong Kong at prices ranging from HK$138 (nearly seven times their face value) to HK$1,338. The remainder were available in Macao and overseas (authorized agents approved by the International Olympic Committee). Banknotes positive view for the ancient Olympic movement birthplace site building pillar design, the Beijing 2008 Olympic Games emblem and the Hongkong Bank of China Tower designs. The double-sided carving intaglio printing process printed, money is on the back of the Chinese bank name, used pattern, denominations are used in intaglio printing, touch has obvious concave, convex sense. The king is back in Beijing Olympic Stadium, National Stadium ("bird's nest"), and "auspicious clouds" and other symbols of Beijing Olympic Games and other sports multicolor graphics. Hongkong Olympic Games Commemorative Banknote used embossing contact denomination digital anti-counterfeiting technology. In Hong Kong and Macao coins left watermark pattern above, the Bank of China emblem below, when the money placed eyes parallel to 45 ° or 90 ° rotation of different shapes, visible denomination figures "20" logo. 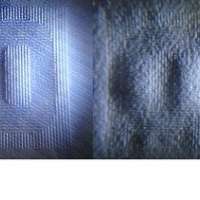 The invisible denomination numbers using the tenon type stamping production, is the use of making good die stamping banknote paper, so that the banknote paper surface concavo-convex ordered wrinkles, thus forming a kind of fixed pattern, in order to achieve the purpose of security. 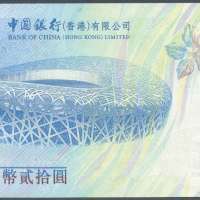 The pictures, wordings and symbols of the Beijing 2008 Olympic Games have been adopted by the Banknote. These images, be they bold or elegant, dynamic or still, embody the harmonious blending of ancient civilization and modern culture, reflecting the history and development of the Olympic spirit from generation to generation. These icons signify the passion and best wishes of the people of Hong Kong towards the Beijing 2008 Olympic Games. 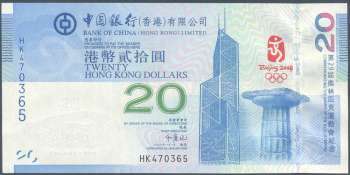 The Banknote is the legal tender of the Hong Kong Special Administrative Region, but not intended for use as general local banknotes in circulation. The issuer indicated that the banknote may not be accepted by vending and ticketing machines. BOCHK will only exchange it according to its face value. The Chief Executive of Hong Kong is the President of the Executive Council of Hong Kong and head of the Government of the Hong Kong Special Administrative Region.